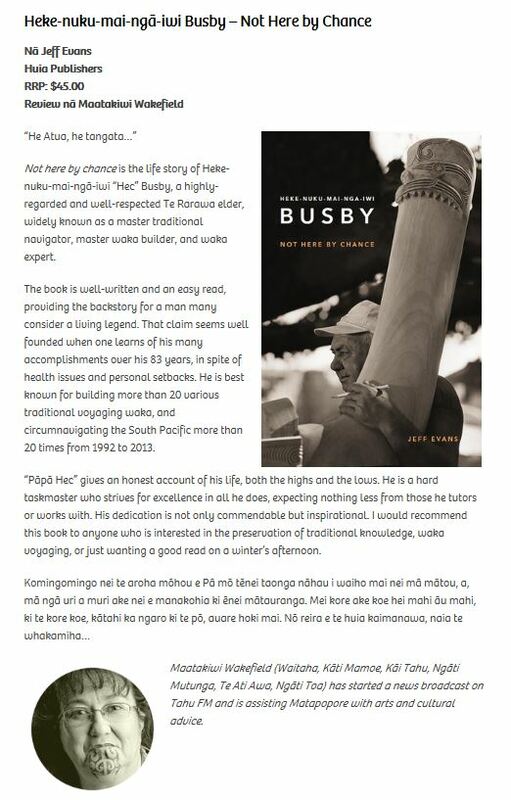 A couple of months ago Mark Revington, the editor of Te Karaka magazine, asked me to write a short piece about my experience writing Hec Busby’s biography. 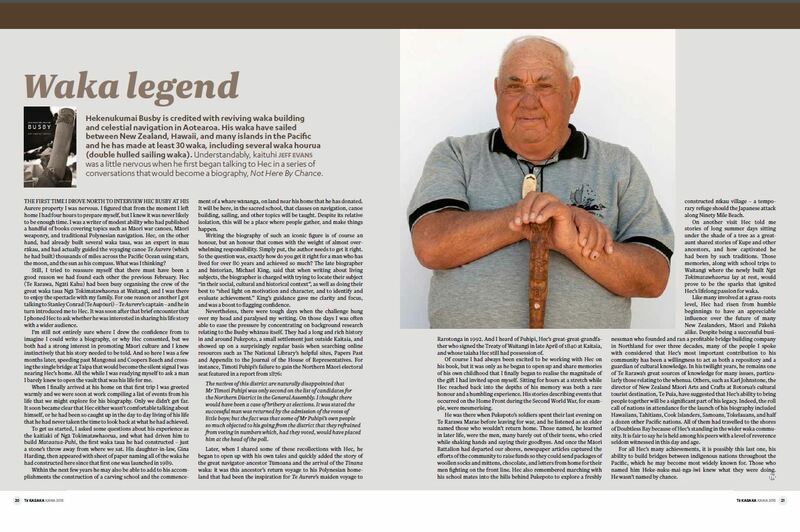 The magazine belongs to Ngai Tahu, a tribe that encompasses most of the South Island of New Zealand, and it is without doubt a quality publication. I’ve been honoured to write occasional articles for them over a number of years, and I jumped at the opportunity. All the same, it was a new experience to feature front and centre in one of my own articles, but it allowed me to enjoy [what for me] is a new style of writing. If you click on the article below it should enlarge enough for you to have a read. The book is well-written and an easy read, providing the backstory for a man many consider a living legend. I would recommend this book to anyone who is interested in the preservation of traditional knowledge, waka voyaging, or just wanting a good read on a winter’s afternoon. It’s always nice for a writer who’s put his name on the line to get some positive feedback! If you know me at all you’ll know I enjoy my sport, and I’ve been fortunate enough to write freelance for SkySports: The Magazine over the past 4 or 5 years. Well it seems an era is coming to an end, with word that the magazine is closing shop. After 10+ years of feeding kiwi’s a decent diet of sports stories, Sky has decided to stop publishing their magazine. Although I’m naturally sad to see the magazine go the way so many others have in recent years, I’m proud to have been a small part of it’s history, and have cherished the opportunity to be published within it’s pages (you can scroll through most of my articles HERE). What I’ll miss the most are the introductions writing for the magazine afforded me into the sporting lives of so many great athletes. I’ve interviewed world champion cyclists, ironmen and softballers – and I’ve been there when national rodeo stars have dragged themselves out of the mud, battered and bruised – and I’ve been in attendance when Japanese masters have instructed in both kendo and kyudo, and I’ve loved every moment of it. So HERE is a link to my very last SkySports article: The Top Two Inches. It looks at what it takes to make it as a pro athlete, and encompasses interviews with another four champion Kiwi athletes: Stacey Jones, Gary Anderson, Cory Hutchings, and Eric Murray. There will be a full version of the story in my ‘Articles’ section within a few days. Well my latest book has been launched and is selling well, so all the boxes are ticked so far! 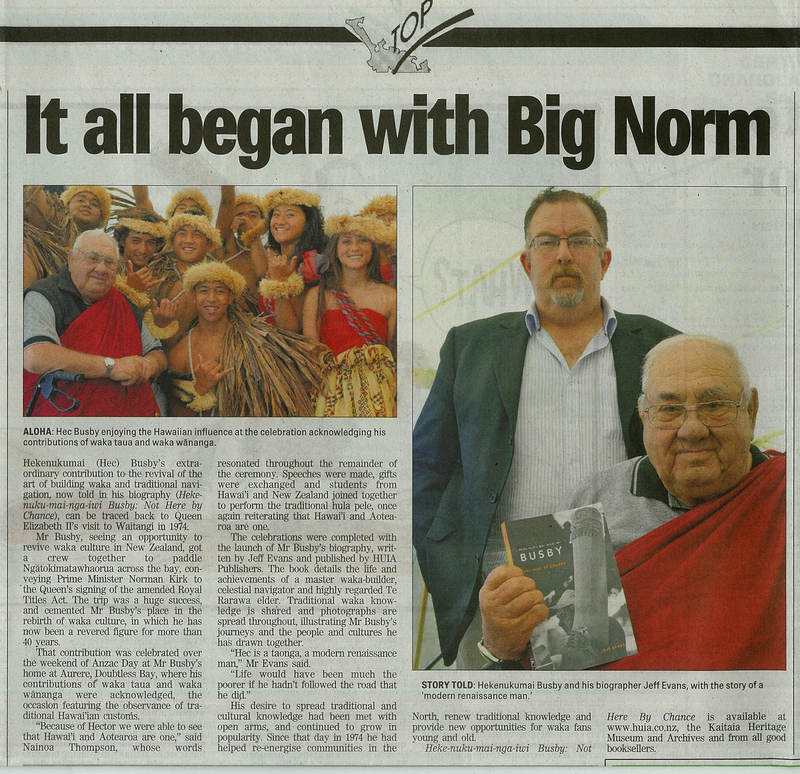 The cut out above is from the Northland Age, a local newspaper from the Far North where the launch was held. 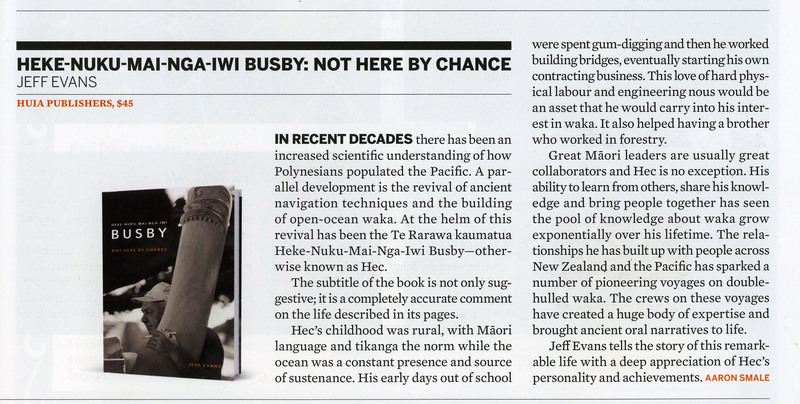 That’s me in the right hand photo, standing behind the subject of the biography, Hec Busby, who’s holding a copy of the book. It was a great day, with the crew of the voyaging canoe Hokule’a in attendance, as were many of the Polynesian Voyaging Society’s hierarchy and numerous locals of note. 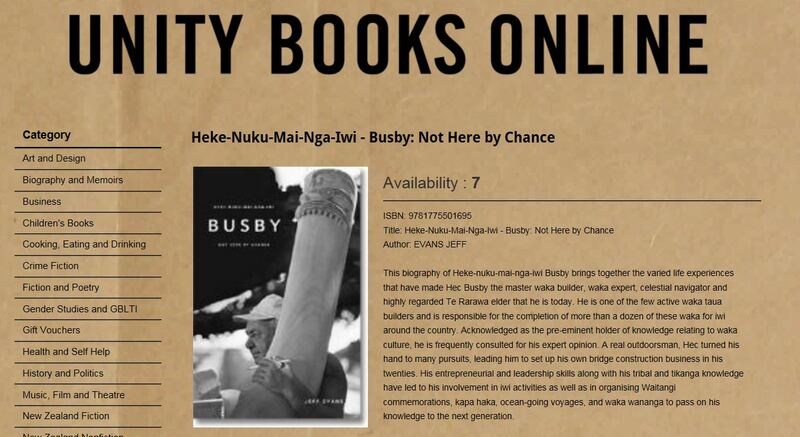 Huia Publishers travelled up from Wellington for the day and sold out of the 100+ copies of the book they brought up with them, and copies have been selling like hot cakes at Te Ahu, the local museum and cultural centre, ever since. With Hokule’a scheduled to leave Aotearoa – New Zealand the following day, we were honoured to share the day as our Hawaiian cousins prepared for their voyage with karakia (prayers) and words of thanks to those who supported and housed them during their stay. All in all it was a memorable day. Finally, it’s in my hot little hands!! Hec’s biography has finally arrived and I’m happy as can be. The team at Huia Publishing have done an awesome production job on the book and I really couldn’t be happier. Yeah, it’s taken way longer than it should have, but all good things take time, right? Anyway, it’s such a relief to know the books have arrived in the country and we will be able to have them blessed at Hec’s home on the 25th of April. The launch is scheduled for the same weekend that the Hawaiian canoes leave for Australia on the next leg of their round the world voyage, so I know it will mean a lot to Hec to have the book launch attended by his Hawaiian brothers. They have been so supportive of Hec and his voyaging ambitions that its only right that their schedule allows them to attend. It promises to be an epic weekend! First, it’s important to note that this particular expression is hotly debated. Many references now consider “hone in” a proper alternate version of “home in.” That said, it is still generally accepted that “home in” is the more correct phrase. To home in on something means to move toward a goal, such as “The missile homed in on its target.” To “hone” means to sharpen. You would say, “I honed my résumé writing skills.” But you would likely not say, “The missile honed in on its target.” When followed by the preposition “in,” the word “hone” just doesn’t make sense. The term “bated” is an adjective meaning suspense. It originated from the verb “abate,” meaning to stop or lessen. Therefore, “to wait with bated breath” essentially means to hold your breath with anticipation. The verb “bait,” on the other hand, means to taunt, often to taunt a predator with its prey. A fisherman baits his line in hopes of a big catch. Considering the meaning of the two words, it’s clear which is correct, but the word “bated” is mostly obsolete today, leading to ever-increasing mistakes in this expression. The book in question had an intriguing cover – a naked fat chap, cycling through a suburban setting on a racing bike – so I picked it up and had a quick read inside, and the writers skill was obvious from the first paragraph. The author, Mike Magnuson, who by the way is a writing teacher at Pacific University in the States, is one of those blessed authors that manages to keep his sentences simple and flowing and engaging and just plain easy to read. His writing is a lot like William Zinsser’s in that regard, which makes it a page turner. Acclaimed fiction writer David Gordon penned an interesting article for the New York Times back in August that recently caught my eye. Titled Writing is a Risky, Humiliating Endeavor, Gordon starts off his piece by describing some of the pitfalls of composite characters, especially from the point of view of his nearest and dearest (and his ex) – and takes us on an interesting literary journey from there. You can read Gordon’s article HERE.